The accolades are still coming in for Beyonce and her Destiny’s Child bandmates after a hugely successful performance at Sunday’s Super Bowl. Celebrities and fans alike were applauding King Bey for her intense, high energy performance. After the approximately 10 minutes set, Beyonce, Kelly Rowland and Michelle Williams were spotted backstage celebrating. 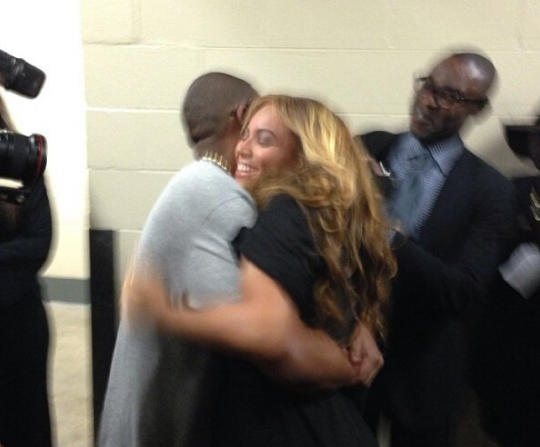 Jay-Z was also on hand to congratulate his wife for her stellar performance. 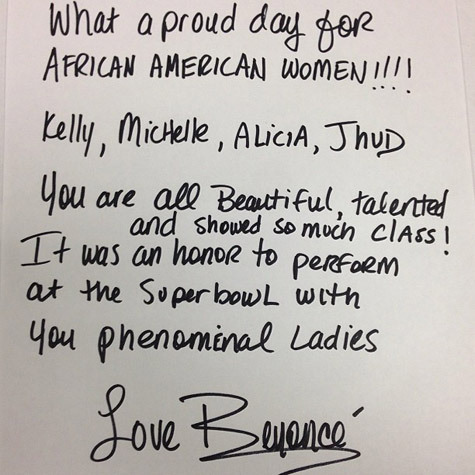 Beyonce also wrote a heartfelt note to her bandmates, as well as, Jennifer Hudson and Alicia Keys, who also performed at the Super Bowl XLVII. “What a proud day for African American women!!!! Kelly, Michelle, Alicia, JHud. You are all beautiful, talented and showed so much class! It was an honor to perform at the Super Bowl with you phenomenal ladies,” Beyonce wrote.